I was planning to ignore this, as I do most Kickstarter news, but it just kept popping up in my feed, and I’m feeling a bit punchy today… OK, I must admit, that in concept, the LUBRI DISC seems appealing. Chain maintenance can be messy business. But this device is only addresses half of that problem, and does it in a way which is less than ideal. If you want your chain to last longer, improve chainring/cassette life span, and make less noise. Lubrication is critical, but even more critical is the part that this product doesn’t address, and will likely make much worse – cleaning. The chain attracts all sorts of nasty stuff from the road, all of which turns into a sort of grinding paste which wears down everything it touches. 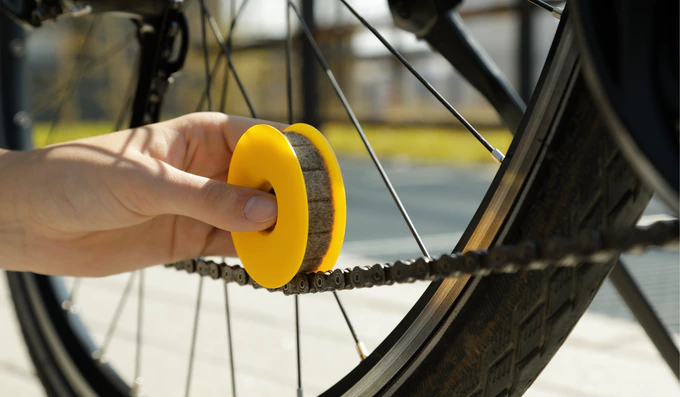 Using the LUBRI DISC on a dirty chain will foul the foam part of the product, and make the problem worse by applying a layer of oil/lube on top of this paste. Unfortunately, there’s no substitute for a proper clean, and that’s the messy part. Once it is clean, unless you’re very heavy handed with the lubricant a minimal amount should end up on the floor. Put down a drop cloth, or something else to catch it, and the environmental issue is sorted as well. Your point is especially true for gravel rides. The amount of grit the chain (and other drive train components) picks up is significant to the point that I might get 1,500 – 2,000 miles out of a chain. No way this product works (as a single solution). I am looking in investing in an ultrasonic parts cleaner. Interesting, that sounds like a great solution. Is it a bike specific ultrasonic cleaner, or something more general purpose? They are mostly general purpose and can be bought for about $100 . Throw chain and rear cassette in and after about a minute they come out nice and shiny. A quick search will give you a good idea which models work best for bike parts. Thanks for the tip. Ordered a 2.5L model, will be interesting to see how well it performs.